Polish Headlight & Taillight Lenses with your hand drill! Polish plastic bug shields, wind deflectors, or any smooth plastic surface to reveal the original shine. Over time, plastic ages and oxidizes just like your vehicle's paint. UV radiation and chemicals degrade the plastic and cause it to cloud or yellow. Replacement headlight lenses can cost over $100 each. Professionals can charge $75 - $100 to restore headlights. Now you can do it yourself with our Plastic Polishing Kit and your own hand drill. 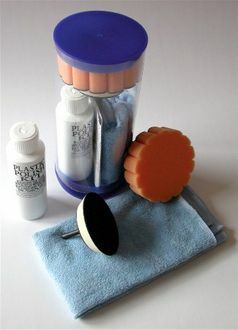 Our Plastic Polishing Kit is designed to remove oxidation from faded plastic on cars, motorcycles, boats and aircraft. It polishes to a smooth, glossy finish with the aid of the closed cell foam pad. The Phase II Plastic Polish fills microscopic pores and leaves a slick, protective barrier that should be reapplied twice a year. If your lenses are very rough to the touch, you may wet sand them with 600 grit sandpaper prior to the polishing process. After polishing your lens to a gleaming shine, apply a coat or two of a high quality sealant.